I finally ventured to MSG last night to take in a Rangers game… and what I saw was not very good. The fourth straight loss and to a team in the Carolina Hurricanes, who let’s face it- they should beat. I can’t put a finger on it and I don’t think anyone really can as to why. The Rangers, at times, show some life and then at other times they look absolutely terrible in all aspects of the game. It’s been an ongoing pattern throughout the year. My personal views are nothing short of being repetitive: If you can’t muster any offense then you have to show up in other ways. By that I mean you have to play a tough, physical and grinding type of game. It’s that simple. Also… what is up with the lack of life at home? The Rangers record at home is hurting this team big time. 12-13-4 is unacceptable at home. All the teams above the Rangers in the standings have winning records at home… go figure! 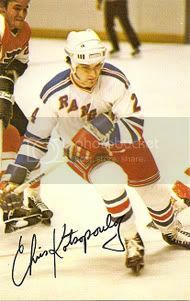 I, along with many others who I played with in the past, just keep shaking our heads about this home ice dis-advantage (I’m sure Rangers fans are as well). I am still hoping that somehow this will turn around. However, the clock is beginning to tick faster and faster each and every day. Rangers fans are also growing impatient as the Rangers playoff hopes are on the line. I just want to take the time to thank everyone who we saw last night at the game. My wife Lisa and I had a great time. Too bad we couldn’t witness a win, but that’s just how it goes. A big shoutout to my man Ron Greschner. Always good to see Gresch and his friends. Oh, I almost forgot! I also saw my former owner in Hartford, Howard Baldwin. 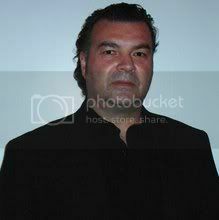 With him was his son, Howard “Bubba” Baldwin. We got a chance to sit and talk extensively with them while drumming up old stories and memories. There were lots of laughs! Over and out! You knew it was bound to happen… the Rangers were on a nice offensive streak with 14 goals in their last two games and the Flyers definitely knew it! What transpired was a large, orange blanket that the Flyers threw at the Bueshirts’ offense and limited them to only 5 (maybe 6) good scoring chances on this night. Philly was the better team from the start. They out forechecked, backchecked, and took away all the momentum the Rangers had going into this one. All of the scoring the Flyers would need came off a James van Riemsdyk backhand rebound on a breakaway. Henrik Lundqvist made the first save, but gave up a terrible rebound right back to van Riemsdyk- who made no mistake with the put back. The second Flyers goal was an absolute killer for the Rangers. While trying to kill a Marian Gaborik penalty at the very end of the second period, a failed clearing attempt by Chris Higgins turned into a back-breaking PP goal with 2.5 seconds to go in the period. 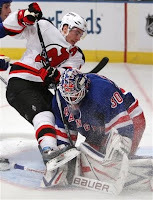 The goal deflected in off of Marc Staal’s skate and went into the net just before the time expired in the period. You have to be better than that and know the situation of the game. Just a bad play and it turned into a fluke goal- which essentially killed the Rangers on this night. There’s really not much else to discuss about the game itself as it was played. The Flyers were better, not by much- but just enough. Case closed. Now we can talk about some of the festivities that occurred during the game. To me, the fun stuff started when Arron Asham was allowed to run over Henrik Lundqvist. Sorry, if the NHL isn’t going to protect him- then a teammate should have. As a player, if you haven’t figured out by now who your bread and buttger is (The King) then you don’t belong on the ice. Next, we have Marian Gaborik tangling with Daniel Carcillo. Are you f*#!ing kidding me?! How did this happen? Carcillo showed how ballsy he was by grabbing Gaborik and then pummeling him to the ground. I know Gaborik dropped his gloves, but this is a mismatch of great proportions. Again… somebody? Please? Anyone should have been all over Carcillo- immediately! I will give Sean Avery and Aaron Voros props for doing what’s right in these situations. First, Avery took on Scott Hartnell (who’s overall game, I personally like). One thing that I don’t like is a player who drops the gloves but wears a face shield. Case in point: Scott Hartnell. Sorry. That just doesn’t impress me one bit. Avery also took on Carcillo in a decent scrap a little later. You just got to love Avery and Voros (Who fought Asham) for providing the Rangers with some toughness and energy. If more Rangers would learn from these guys, it certainly would help in the long run. Well, on to Montreal. Over and out! 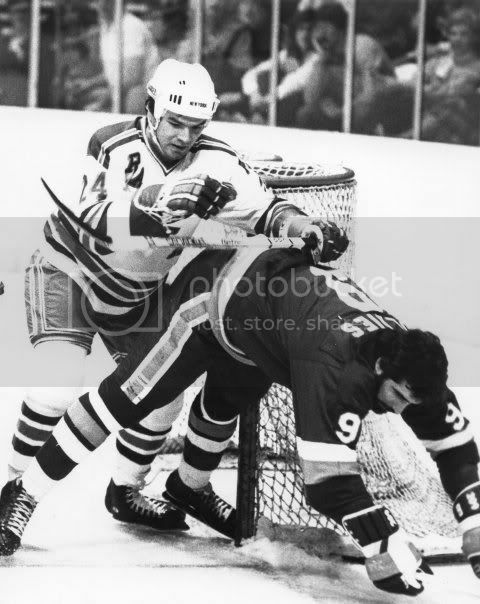 After two disappointing regulation losses (2-0 to Ottawa at home and 4-1 to St. Louis on the road), the New York Rangers faced off against the Montreal Canadiens at MSG in a Original 6 showdown. Unfortunately for the Rangers and their fans, the Rangers fell behind 2-0 in the 1st period to the Habs. The Garden Faithful let the Blueshirts know this as a cascade of boos carried the Rangers to the locker room for the first intermission. Even Henrik Lundqvist showed some anger after the 2nd goal and was probably wondering, “What on Earth is going on with the Rangers and their poor play at MSG?”. I’m not sure what happened in between periods, but the Rangers came out for the 2nd period with a major snarl and it proved to be a tonic for the Rangers’ woes. First, Ryan Callahan scored. That was then followed up by a goal by Brandon Dubinsky. After that, Dubi had an encore and potted yet another goal. Three straight goals! Wow! The goals gave the Rangers the lead that they would not relinquish. The Rangers were physical, nasty, and it let to some nice old-time hockey. Sean Avery squared off with Josh Georges in a spirited battle. After that there was almost a 5 on 5 skirmish which led to Wade Redden squaring off with Benoit Pouliot. To me this showed that the boys in blue were “all for one and one for all”. That, I think, is something Rangers fans have been waiting for: team unity! I liked what I saw and I also believe there are points in a season that ignite or bring a team together. This might be one of those points! At least… let’s hope so. Heading into the 3rd period, Ryan Callahan scored on a PP (nice to see that, even if it had to be reviewed a little after the fact). Marian Gaborik then broke out of his “goal slump” by one-timing a beautiful pass from an unselfish Brandon Dubinsky. Dubi could have shot the puck to score the hat-trick, but he opted for the pass and it was a nice gesture that had a nice result. I give Dubinsky all the credit on that one. Chris Drury then finished off the scoring for the Rangers with a late goal to make the final score, 6-2. A much needed W and 2 big points in the standings for the Rangers. Lastly, don’t read too much into the Avery/Tortorella exchange after Avery’s second penalty. Sure, it lead to a goal by Montreal… but a little verbal barrage never hurt anyone- even if it’s with your head coach. A nice win tonight and hopefully they can use this type of game as a rallying point in their season. Over and out! I just got back from a friend’s house after watching the Rangers lose 1-0 in a shoot-out to the hated New Jersey Devils at MSG. What I witnessed was a classic goaltenders duel between two of the finest in hockey today. Marty Brodeur out-dueled Henrik Lundqvist by stopping 51 total shots and 4 in the shootout. Lundqvist had quite the game himself by turning away 45 shots and 3 in the shootout, but it just wasn’t enough to get the 2 points. The final shooter in the shootout, Patrik Elias, nailed Lundqvist with a clean shot over the shoulder to seal the victory for the Devils. Both teams had their chances in this one, but sadly for Rangers fans- Marty wins the day. I was happy to see that the Rangers were able to compete and play hard against one of the elite teams in the NHL. 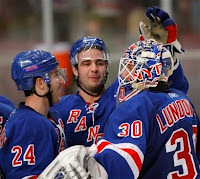 At least the Rangers salvaged a point and they proved for one night that they are capable of playing at a high level. I do realize that goal scoring is still the Rangers' Achilles Heel (proved again in the shootout) and needs to be fixed, but their record in the last 13 is damn good. In the last 13 contests the Rangers acquired 20 of a possible 26 points- can’t do much better than that! How about the Alex Burrows and Stephane Auger controversy? All I can say is that if it’s true, then the NHL has a big problem. If not, it will just go away fast. In my day referees were mostly respectful of the players and the game. I will say this though... some thought they were the show- instead of the players. Lastly, one more topic. My Quinnipiac Bobcats have sort of hit rock bottom after a blazing start in the ECAC. After getting 7 wins to start the season they have now lost 6 in a row in the ECAC. Struggling? Yes. Down and out? No. It’s time for the players to dig down deep and play themselves out of this funk. What other choice do they have? Over and out! Sean Avery was in classic form last night at MSG where the New York Rangers defeated the Minneso... er, Dallas Stars, by a score of 5-2. Avery scored and assisted on 3 other goals, got in Marty Turco's face (as well as everyone else), and he really had the Dallas Stars' attention last night. Remember- this is the team that signed Sean Avery to a 4-year, 15.5 million dollar deal and when things went wrong, they blamed it all on Sean. Give me a break! 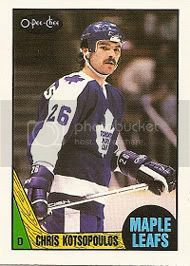 Luckily for Rangers fans, he ended up back in Ranger blue and now the Stars have no one else to blame but themselves. Like I always have maintained, Sean Avery could play for my team any day, any week, any time. Getting back to the game... The Rangers found themselves down early on a fluky goal by Brad Richards. I was thinking to myself, "Here we go again". Luckily for the Rangers, Sean Avery responded with a goal on a slap shot that beat Marty Turco on the shortside. There was a nice pass by Matt Gilroy to set up Avery’s goal, by the way. Later in the period Sean Avery’s passing attempt found Marian Gaborik (who yet again showed he has the fastest gun in the East) who made a nice forehand to backhand move that defied logic. I’ve played and followed hockey for a long time and I am thoroughly convinced that Marian Gaborik has the fastest and quickest hands that I have ever seen. 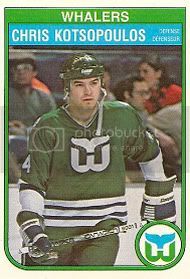 Heading into the second period the Stars managed to fluke yet another goal off of a Rangers stick (that was held by Chris Drury) as Jere Lehtinen got credit for the goal. Ales Kotalik (believe it or not) blasted one past Turco’s short side yet again after a nice feed by Sean Avery to give the Blueshirts a 3-2 lead with one period to go. In the third period Avery managed to pull off a magical spin move off the left boards that allowed him to find a hard charging Chris Drury for a nice empty-net deflection. See what happens when you go hard to the net? The Rangers then held on to a 4-2 lead and Ryan Callahan finished off the scoring with an empty net goal making the final score 5-2 in favor of the Rangers. The win gave the Rangers their 2nd in a row at home (Wow! Really?) and a big 2 points in the standings. Overall it was a very good night for the Rangers: Lundqvist was solid, the D was strong, the effort was there, and Sean Avery was clicking on all cylinders. With a record of 7-1-2 in their last 10, have the Rangers finally found some consistency? Who knows. One thing that is for sure is that if you play smart, hard, and give everything that you got- the results usually fall in your favor. The proof is in the pudding, there’s no fooling anyone. Well, next up for the Blueshirts is a tilt in Atlanta against the struggling Thrashers tonight. The Rangers find themselves in the midst of a playoff push and right now all points are as valuable as gold. Let’s hope that the Rangers can put together another solid effort and take one on the road. With reports being that Chad Johnson will make his first career NHL start, the Rangers will need to give it all they have to make things easier for their rookie net minder. Lastly, I want to take the time to congratulate Team USA for winning the gold medal in the World Juniors Championship. They had a thrilling OT victory over Team Canada (who mounted a late, third period comeback). As you know, I am Canadian and I was cheering Canada all the way- but you have to appreciate and give credit where it’s due. Team USA, led by Rangers prospects Derek Stepan, Chris Kreider, and Ryan Borqoue, deserved the victory. No sour grapes from me. This win may get more fans in America to start watching and get into the great sport of hockey- because let’s face it, it is needed! Over and out! By the way... check out this great post-game gem from the one and only Sean Avery. With the new year upon us, the New York Rangers have essentially reached that point of the season where the playoffs are the number one goal. After being totally embarrassed at MSG by the Philadelphia Flyers (in a game where the Flyers kicked sand in the Rangers faces) the boys in blue rebounded with a good win over the Carolina Hurricanes in Raleigh by a score of 2-1. Yes, I said a “good” win. Not a great one as the Canes are cellar dwellers. I will give the boys credit though as they played with effort and inspiration on the road to take the win. I know some are wondering why the Rangers do this more so on the road than they do at MSG. I don’t know why, but if you have the answer… then please let me know! The Rangers are basically now at the half-way point. 40 games, 19-17-4, 42 points, and 8th place in the Eastern Conference. The scary part is that only 7 points are separating 10 teams! That’s right… 10 teams! Ranging from 4th to 13th place the playoff push is on big time for the Rangers. I believe the biggest obstacle for the Rangers is themselves. When they play hard and with effort, you can live with the results- win or lose. When they don’t, then you get what you deserve. The Eastern Conference is jammed tight with playoff contenders, it should be fun to watch how it all ends up! On a sad note, us in the hockey world send out our thoughts and prayers to OHA linesman, Kevin Brown. He is currently in serious condition after a skate blade slashed his throat while breaking up a fight. Get well soon. We’re thinking of you. Over and out!